There is a new invasive insect in southeastern Pennsylvania, Lycorma delicatula, commonly known as the spotted lanternfly (SLF). This insect has the potential to be harmful to grapes, stone fruit, and trees. 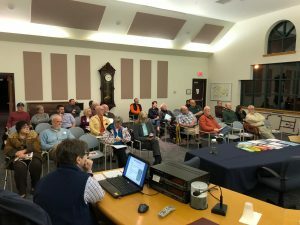 To try to limit the spread of SLF, the Pennsylvania Department of Agriculture (PDA) has established a quarantine order in municipalities where SLF already exists. All of Upper Saucon Township is in the quarantine area. All residents and businesses must comply with the regulations. The PDA has the authority to fine anyone who willfully violates the quarantine order. If you live outside of the current (quarantine area) in Pennsylvania and find a spotted lanternfly, report it! Use this interactive Plant Pest Quarantine Search to see if you’re in the spotted lanternfly quarantine area. 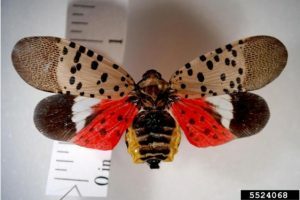 The Spotted Lanternfly adult is approximately 1” long and 1/2” wide at rest. The forewing is grey with black spots and the wings tips are reticulated black blocks outlined in grey. The hind wings have contrasting patches of red and black with a white band. The legs and head are black; the abdomen is yellow with broad black bands. Immature stages are black with white spots, and develop red patches as they grow. If you have questions or would like additional information on the SLF, please use these links for information provided by PennState Extension and The Pennsylvania Department of Agriculture. 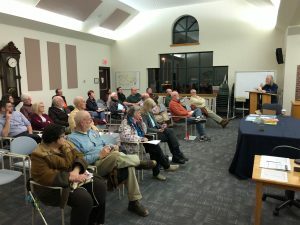 Upper Saucon Township hosted a Penn State Extension Workshop on the Spotted Lanternfly on February 28th.